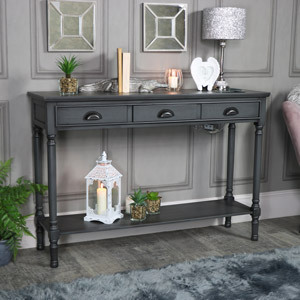 The Lancaster Range is perfect for those searching for a furniture collection that can blend into vintage style interiors just as well as contemporary ones. 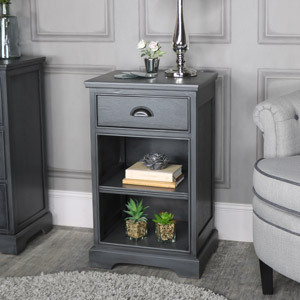 The Lancaster Ranges simple, stylish and versatile design makes it an incredible storage solution able to suit all tastes. 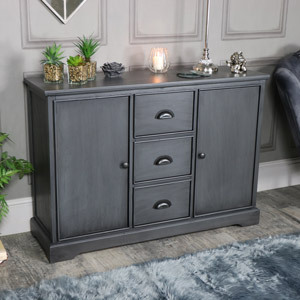 The Lancaster Range includes items designed for bedroom, living room, dining room and hallway use including a one drawer two shelf side table, a four drawer chest of drawers, a large coffee table, a three drawer console table and a gorgeous Large three drawer two door sideboard. This range is crafted from wood, has a smooth dark grey finish and black vintage style metal cupped handles.